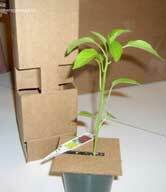 Packing PlantsAs growing, living organisms with definite needs for sunlight and water, plants require a large amount of preparation and care in packing to protect them during the trip to their new home. Obviously, longer distances are harder on plants, especially if they are stored in a box in a dark moving truck. Follow these steps to give your plants their best chance at a successful transition to your new home. Most plants carry insects, fungus, and other sources of disease, and states that depend on agriculture impose heavy restrictions on what plants may be transported across state lines. Check into the border laws of the states you will be passing through to find out whether your plants will be allowed through. Often, states will only accept plants that have spent their entire life indoors, without having contacted outside soil. It is very important to respect these state restrictions; entire crops and harvests have been ruined by the careless introduction of foreign pests. Many moving companies will not pack and transport plants. If this is the case with your moving company, you will have to make room in a separate vehicle for them. For your plants’ safety, replace any breakable flowerpots with more flexible, durable plastic ones. If plants are traveling in your private car, you can brace them and keep an eye on them during the trip, but if they are going in the moving truck they should be packed in a box (punch holes for air circulation and use a towel to soak up any leaking water) to give them protective walls against shifting items. Give your plants as much sunlight exposure as possible immediately before and after the trip, and try to park their vehicle in shaded areas during stops to prevent overheating.